Wow that looks like kit for V8 circle track racers. I have 2 systems to build soon somewhat like yours, my Peel and my lawnmower with a rusted hollow peashooter. Yours will take a big block hi rpm engine to suit those big tubes. Nice work. 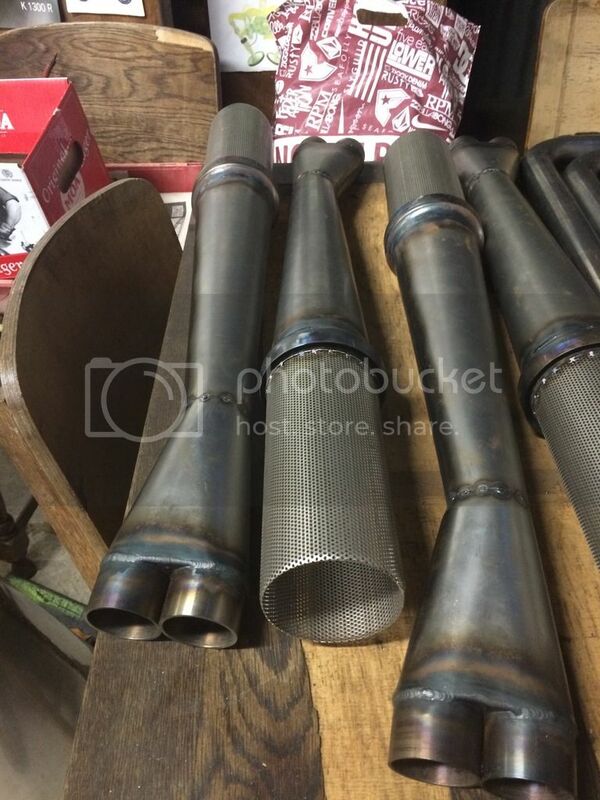 Are those 1 5/8" tubes? looks like pipes vary in ID so maybe a stepped dia hybrid 2-1 is planned to reflect sound waves back in nick of time through one or more zones of rpm while also drawing each pulse behind low pressure of the prior pulse. Besides the distance from exhaust valve to each step up, the volume of next step up tube matters too. Dunstall showed sharp bends do not bother exhausts like in does intakes. Bet these are loud enough to please Hog riders. Nice work. Will they be coming back this way? You gonna set up as importer / distributor Chris ? Good show, put me down for one. I'll need one til Ken's Titanium specials start rolling off the line. These seem like a sure seller and its strange that Steve would give them up. All best to whoever puts them out. I hope it works out for you Brooking. Last year I talked to Steve about his systems, he said he wasnt getting any more made and I also suggested I could get them made in NZ for him, he wasnt interested in that idea either. So a year down the track I am getting 2 x sets made for myself, and the other 2 x sets are being made by the manufacturer as it was just as easy to get 4 x sets don at the time. The guy works from home, he is about 5 minutes drive from my home and has been building custom exhaust systems for cars and bikes for years. 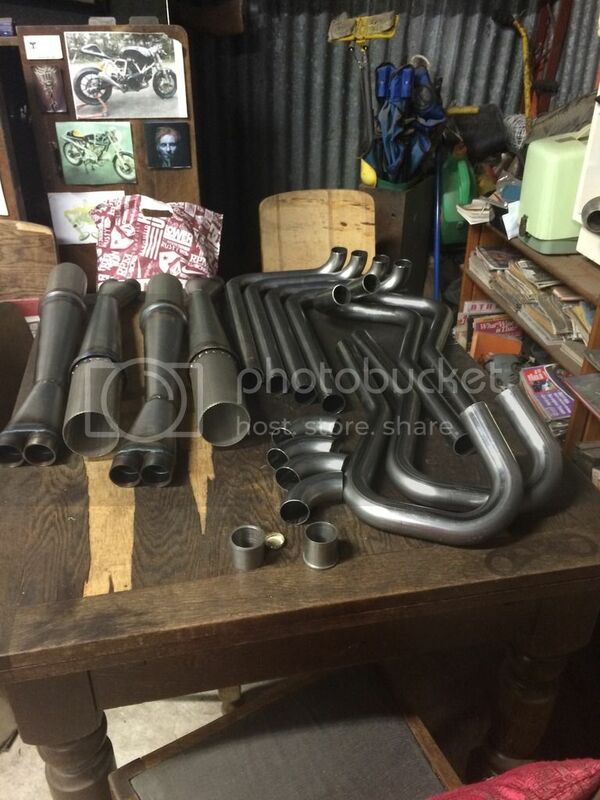 He bought a lot of mandrils & gear off an older established exhaust builder some years back. We have copied an original Maney set . I will need to run some R&D before we go ahead and make more. Heres some calculators to play with or see if predicts what Maney system found to work well. For DIY hay seeds => merging converging collector tube-age galore. The outlet of the collector looks too small. I found years ago that if the cross-sectional area of the outlet is smaller than the total cross-sectional area of the header pipes it knocks too much off the top end of the rev range. Even so you will probably lose 1000 RPM off the top - it will probably drop the top from 8000 RPM to 7000 RPM. My header pipes have an ID to exactly match the stub and port in the head. I use a rev limit of 7000 RPM, which is probably still too much. The exercise of cutting the tail pipe and collector back sequentially and fitting a short intermediate piece, progressively getting larger is worth doing - note the effect on torque and top end. Perhaps you've not read the whole thread here? The purpose of what Mike is trying to achieve here is to copy the Maney system... not re-invent the wheel. Changing it would defeat the object somewhat. Well, totally in fact !! I for one is fascinated by Al 2-1 insights so will pow wow with him and online calculators to try to defeat Maney system for Peel. Peel will follow more alone Burt Munroe systems and just put up with the initial tire spin on easing out clutch to get going. Good on yer Steve, and good luck with your designing and experimenting (seriously). I was just trying to point out, that this is not what this thread is about. This thread is about progress with regards to manufacturing a small batch of accurate copies of a proven system. A very different topic, and for a different audience (and hence perhaps a different thread) to those wishing to delve into the theory, design and experimentation for themselves. Ok I sent this lack of Maney systems to an expelled member in NZ that bought an exhaust system shop with the past owner willing to keep running it. Competition helps improve the breed but you have a good head start. NZ seems to be becoming the centre of the Norton race exhaust pipe world !! Do keep us all posted Steve.